If, like us, you grow your own potatoes and find that you have a large number of "marbles", i.e. small 1.5 - 2cm (1/2" - 3/4") size at this time of year, this could be a recipe for you. The idea started when we made a delicious Gujarati potato dish that required boiling, frying and lots of other steps to produce. Needless to say, it was great but we were looking for something simpler and quicker. After a few tries we ended up with this excellent spicy salad. Those small potatoes will be gone soon! Allow 2 - 4 ounces (50 - 100g) of potatoes per person. Make sure that you wash the potatoes carefully and discard any that are misshapen or damaged. We find that scrubbing in bulk in a bowl with a brush works best. 12oz 350g small potatoes, skin on, clean and firm new types will do if cut into 1.5cm (1/2") pieces.. Use a variety that does not disintegrate easily when boiled. 150g (5oz) Greek Style plain yogurt or use a low fat type if you are on a diet! You will need a saucepan with lid to boil the potatoes, a bowl to mix the ingredients and a dish to serve the result. Prepare the potatoes as above, making sure that you remove any obvious blemishes (if you don't like the look of them, don't use them!). Bring enough water to cover the potatoes to the boil. Add the 1tsp salt and the potatoes. Boil moderately until the potatoes are cooked but firm and not falling to pieces. When cooked, drain the potatoes and leave to cool (best) or douse with several changes of cold water and make sure that they are cool (in an emergency). Put the yogurt into a bowl and whisk gently until it has an even constituency. Mash the mint leaves thoroughly in a mortar and pestle or chop them extremely finely then crush. Add the mint, cayenne, salt and cumin seeds to the yogurt and mix thoroughly. Make sure that the mint is well dispersed. 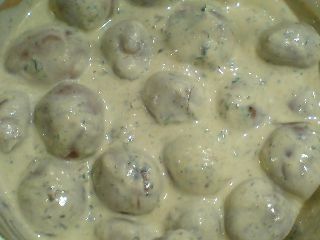 Finally add the potatoes and stir carefully to coat them with the yogurt mixture. Serve this dish with salad meals or as a side dish with curries where it can cool the palate if not too much cayenne is used.